My boyfriend is a bit of homebody. If he has to leave the apartment, walk to the subway, take the train for more than a half an hour, it will 99.9% likely not be for food (let’s be honest – it’d probably only be for something sports-related). But we were able to be adults about it and come to terms by old-fashioned negotiation. Sunday was his day (Steeler’s game at Irish Exit – RIP), and Saturday was mine (Forest Hills, Queens). Fair tradeoff. Slightly off of Queens Blvd on the corner is Queens Bully- aptly named. Opened just last year, the menu is generally American fare but with some multi-cultural inspired flavors (Southern, Indian, comfort food – you name it). It’s a pretty big restaurant with a rustic feel and walled with bright large windows on either side (perfff for #foodporn shots). We went during brunch so we obviously had to order the Eggs Benedict. 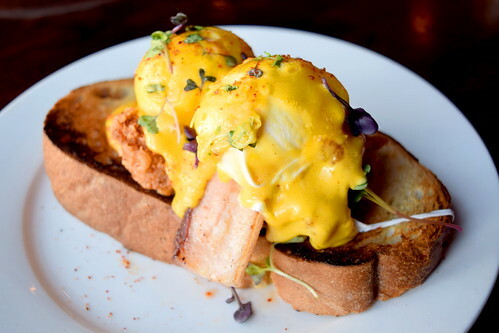 Under the two perfectly poached eggs (I’m an egg-snob; I can make that assessment) was a slab of thick house bacon and juicy pieces of chicken thigh. 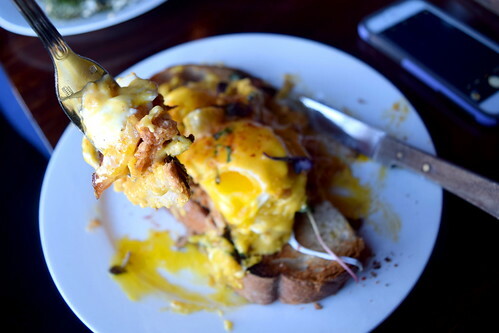 All of that was atop a lightly toasted thick slice bread and smothered in a velvety Hollandaise sauce. 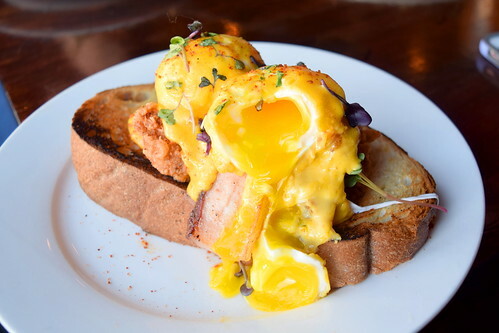 #Yolkporn at its finest. 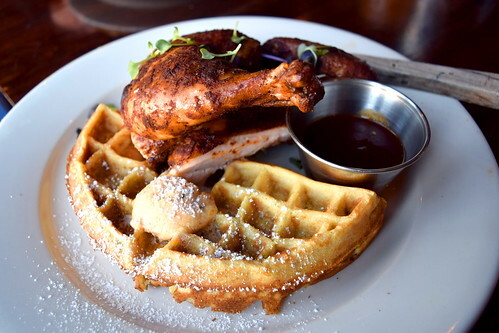 As suggested by the owner, Rohan, we also got the Chicken and Waffles. The chicken was not fried, but perhaps smoked(? ); but I guarantee you won’t miss the fried-ness. 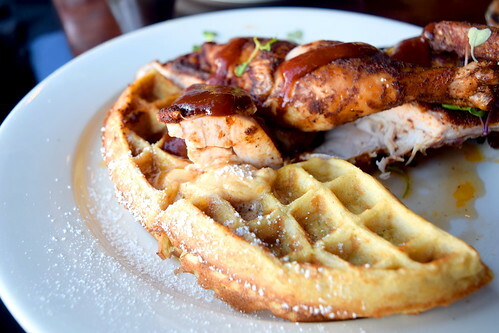 The warm waffles slightly melted the flavored butter, and the accompanying sauce really tied everything together. Side note – the waffles are made with shredded zucchini which lent a lightly crisp exterior (and it’s like healthier, duh). 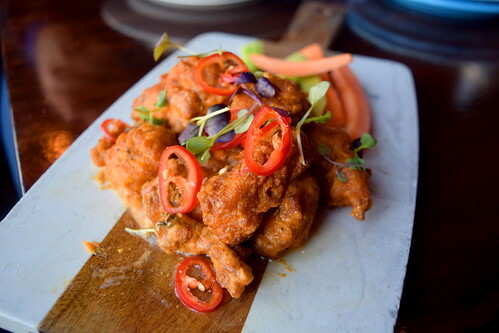 While chicken wings from an average bar are usually tasteless and lackluster, Queens Bully’s Butter Chicken Wings are the very opposite. Coated in a creamy Tikka Masala sauce, the wings brought that familiar heat associated with wings but with an extra punch. Plus, I mean, where else can you get Butter Chicken flavored wings? 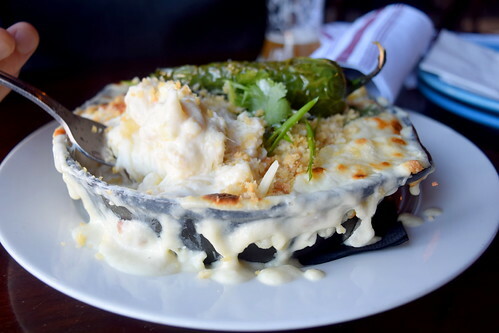 Last but not least – MAC AND CHEESE! 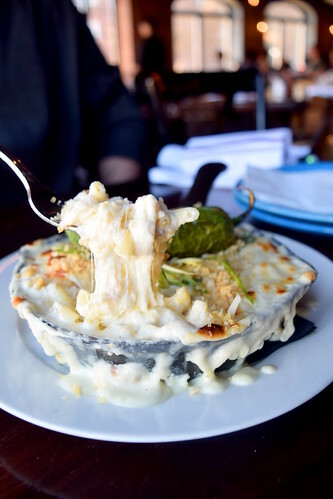 There were a variety of options to top this cheesy appetizer but jalapenos won for my spicy-loving boyfriend. 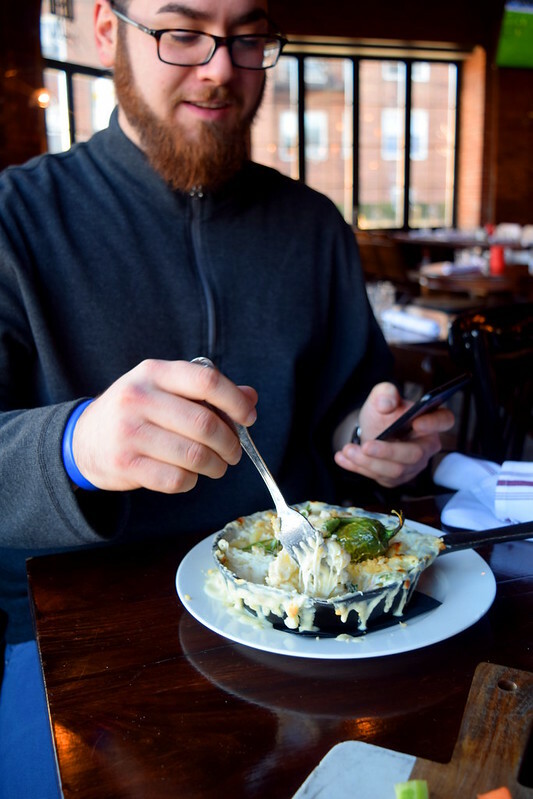 Although there were sliced jalapenos mixed into the mac and cheese, the star was this blistered and charred whole jalapeno on top. Like, words cannot even explain right now. Photos don’t do it justice. I mean, you’re just gonna have to go try it for yourself. 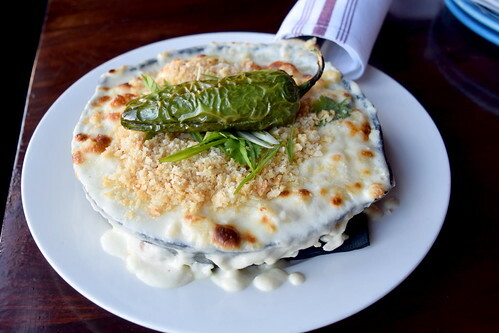 The bubbling cheesy dish came hot and ready in a little cast iron plate. 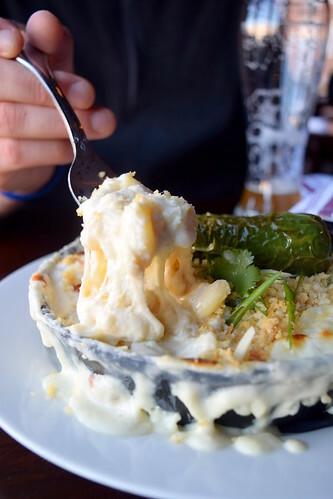 The blend of cheeses weren’t overwhelming but you could still pinpoint the different flavors. You got the extra cheesy sauce thing over here, nicely al dente pasta over there, and mixed right in were these golden toasted breadcrumbs to bring all the necessary textures together. 10/10 will definitely be back. Oh and the beer list and service were on point!